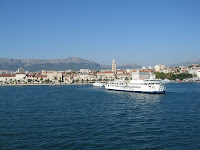 Split & Trogir left a lot to be desired. 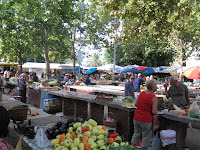 This impression could have been caused by the extreme heat, the lack of sleep (we had to get up at 4am to catch our ferry to Split), or the fact that there wasn't much to do (they're both more "industrial" towns, so not as much fun for tourists). 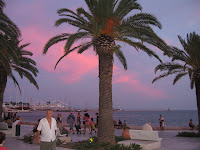 They both have charming old city centers with castles, churches, squares, and huge, vibrant markets. 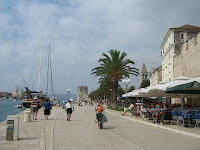 Trogir is even listed as a UNESCO World Heritage site. But the tourist stuff took only 2 hours to do. At which point, we were so overwhelmed by the number of tourists and the heat that we headed to the beach. The beach (i.e. concrete deck around the bay) was my favorite part of the days. Croatians play this random water hackeysack/soccer/acrobatics game. Many of the moves are very impressive, like the black flip, half twist, kick with foot in air before a wave comes. 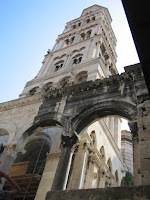 Must see's in Split & Trogir: 1. 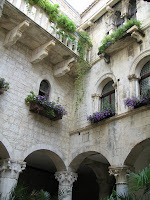 Flower growing on every balcony. It's like a giant garden. 2. 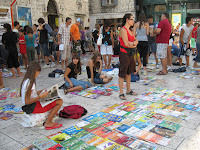 Little kids selling their school books in the town square. So much for centralized book sellers, it's all about bargaining here. 3. Unsafe metal & cement staircases and decks. Building safety codes are not up to standard. 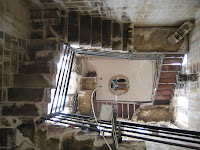 In Split, I climbed a 8 flights of metal stairs to the top of the bell tower. During the entire climb, the stairs wouldn't stop shaking due to two little boys stomping up them ahead of me. I thought they'd break away from the wall. It also didn't help that there were often waist high windows, with no safety bars, on the climb up which would be easy to fall out of. During the walk, I kept telling myself to turn around for safety reasons. Ironally the next morning, there was a news segment showing an apt deck that collapsed and crashed into a car below. I passed on climbing the next bell tower. 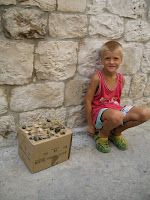 Pic9 (below): little kid who is very proud of his seashell collection. He pushed another kid out of the pic so that it was just him.